Who doesn’t love a bit of chocolate? If you want to indulge a loved one, why not treat them to some quality chocolate. Chocolate is one of those rare gifts – people love to get it and it really doesn’t have to cost the earth. The popularity of chocolates is demonstrated by the fact we choose it again and again as gifts at Easter, Valentines Day, Christmas, Birthdays, special treats and much more, and it’s an equally good gift idea for any occasion or for no occasion at all, in fact. If you are looking for personalised chocs, trusted chocolatiers Thorntons have a range of personalised gift idea available. Spell out you feel towards them by creating a message in a box with some superb, hand crafted alphabet truffles. 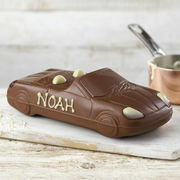 Or choose a chocolate car or champagne bottle and have it personalised with the addition of a name written in white chocolate. Find out more by visiting the dedicated Personalised chocolate gifts page on the Thorntons website. 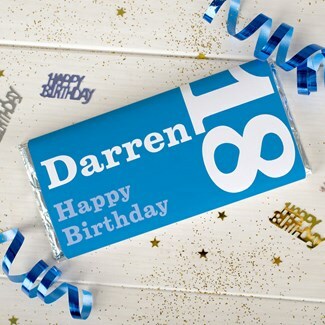 Or why not get a really cool personalised chocolate bar where you can have a name added to the design of the paper wrapper around the bar. The bars from Getting Personal cost £5.99 each and there’s loads of different designs to choose from that can be customised.